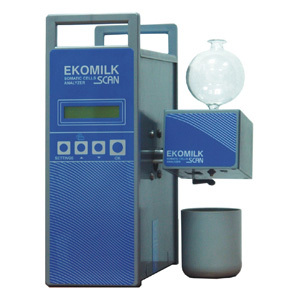 Ekomilk Scan is a somatic cell counter from Bulgaria. The Somatic cell count (SCC) determines the quality of milk and early detection of sub clinical mastitis as SCC is positively correlated with presence of infection. The Ekomilk Scan is cost effective, accurate, compact, portable, lightweight, user-friendly, fast and low cost device with internal memory for 250 readings. It is compatible with computers and thermal printer and can be used at the organized dairy farms and milk collection centre.